Every Parents Association Executive Board position is a one-year term only—which means every position is open every year. Elections are held in June, however the PA has two open seats on the Executive Board: the Secretary position and Assistant Secretary positions. In addition, every year at our first PTA meeting we elect a Freshman PA representative and a Freshman SLT representative. If you are interested in running for any position, simply fill out the nomination form available at the link below and email it to laguardiahspa@gmail.com. Please email nomination forms by Friday, September 21; however, nomination forms will also be accepted from the floor on the night of the election for both PA and SLT positions. The election will take place at the General PA meeting on Tuesday, September 25th at 6 pm. The only qualification to run for office is that you be a parent or guardian of a student currently attending our school (however, as per the Chancellor’s regulations, DOE staff members of LaGuardia High School are not allowed to run, even if they have a child in the school). We have many graduating parents and there is always room for parent volunteers who want to get involved in our school—please consider nominating yourself for one of the many board or SLT positions!! If you have questions, please email laguardiahspa@gmail.com. The election for the Freshman Representative to the SLT is also being held at the same time and place. More info on the SLT is provided below. For complete info on the available LaGuardia PA/SLT positions and to download a 2018-2019 nomination form, click on the links below. SLT nominations will be taken at the PA meeting on September 25th. 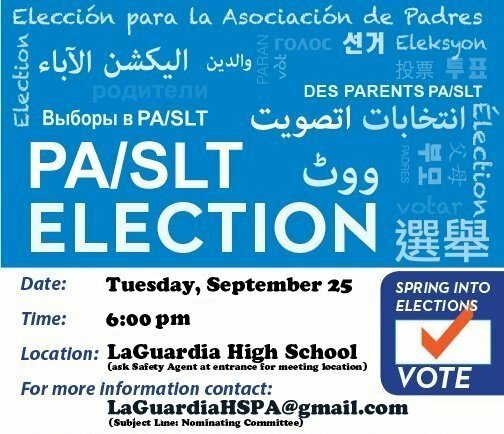 Elections for a freshman parent representative to the 2018-2019 School Leadership Team (SLT) will be held at the General PA meeting on September 25th, 2018. The New York State Commissioner of Education has mandated that every school in the state have a School-Based Leadership Team (SLT), whose purpose is to further the excellence of education at the school through the mutual efforts of its core constituencies — students, teachers, parents and administrators – all of whom are represented on the committee. The LaGuardia Arts SLT usually meets once a month, at 4:15 pm on the day of the General PA meeting. The SLT is the policy-making arm of the school and engages in decision-making by consensus. Meetings are held 10 times during the school year during the late afternoon. Meeting schedules are determined annually in the fall. SLT elections are held each spring. The freshman rep to the SLT is elected at the first PA Meeting in September.